Picture the scene. You're sweltering in a Taiwanese boardroom, the mercury is at a point you didn't know it could go to, humidity is a muggy 90%, you've got a fantastic new product but there's a problem - no killer name. Perhaps the atmospheric conditions in Taipei lead to mild delirium, and for the sake of Asus' latest naming onslaught I really hope that's the case as surely something has been interfering with its marketing team's decision making abilities. Right? 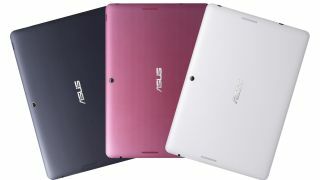 I can understand the initial thought process behind the likes of the Transformer Pad and PadFone - Asus was looking to keep it simple. A name which tells you exactly what you're getting, what's not to like? It's working for Apple, just take a look at the iPod, iPhone and iPad - a foolproof plan by all accounts. However Asus isn't Apple. Where the Cupertino-based firm has a very narrow scope in terms of products the opposite is so for Asus, which has seen tablets explode out of every orifice and it's left a nasty mess in the branding department. Something which started life as an easy tool for consumers to discern the difference between products has now become one of the most confusing and tedious mental workouts which leaves you exhausted and with little, if no reward. We've currently got the Asus Transformer Pad Infinity and Transformer Pad 300, making up the firm's tablet-netbook hybrid family. Next up is the PadFone, PadFone 2 and PadFone Infinity which sees a 10-inch slate engulf a removable smartphone in its chassis - in the immortal words of Asus' CEO Jony Shih "is it a phone? Is it a pad?" And let's not forget the FonePad, which lets you make calls and send texts from a 7-inch tablet. Ok so that's just about manageable. Just. Although I find a lot of people, myself included, still get mixed up between the PadFone and the FonePad. But wait, there's more! How does the Asus Memo Pad HD 7 sound? It's basically the Wi-Fi-only version of the new Nexus 7 which is lovely and all, but this is starting to get a bit silly. If recently leaked slides are to be believed Asus isn't done there, with delights such as the PadFone Mini, MeMo Pad HD 8, FonePad HD 7 and FonePad Note FHD 6 all on the horizon. Shoot me now. Get out of the sauna! Now if that hasn't sent your head into a spin then perhaps you've spent a little too long in the sauna, but for most of us the simple, clean naming regime which seemed like such a good idea a year ago has now turned into a quagmire of unintelligible gobbledygook and Asus needs to retreat fast to avoid sinking. On the whole I'm usually impressed with the various tablets Asus spews out, but it's doing itself absolutely no favours if it continues to hammer this naming scheme. So a word of advice Asus, ditch these names, rebrand to something cleaner and perhaps cut down a little on the number of tablets you're churning out. At the very least invest in an air conditioner - the heat is clearly impairing your judgement.